Often, I get caught up in the little people of the assassination story. Those who had relatively minor roles seem to fascinate me for their trivial involvement in the great drama. The first article I wrote for the Surratt Courier was about Emerick Hansell, the state department messenger wounded by Lewis Powell at Secretary Seward’s. We know him merely because he was at the wrong place at the wrong time and got a knife in the back for it. Nevertheless, it is the almost trivial characters of the story that continually draw me in. This post is further proof of that. For the past few weeks I have been researching a very minor figure to a great degree. I contacted Harvard University for a picture, made inquiries through Ancestry to help figure out his genealogy, and searched newspaper records for hours on end. Even while I was doing it, I couldn’t help but think, “Why are you going to all this trouble? Who is going to care about the minor details of this minor character?” In truth, I may be the only one who cares about this man and his background, but the search for knowledge is enough motivation for me. Will it change our view of the assassination? No. But in a field where the big picture is explored so many times, sometimes it’s just fun to get lost in the little things. The following is what I have spent my time doing – researching a man who is barely on the cusp of the assassination story merely because I enjoy the hunt. 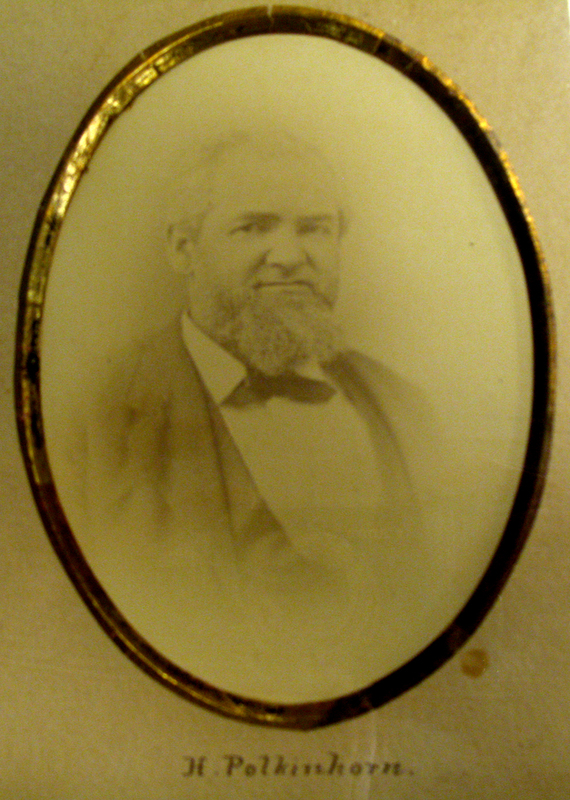 As a young man, Henry Polkinhorn, Jr relocated to D.C. and married Marianne Brown in 1839. Together Henry and Marianne had six children. Marianne died in 1857 and Henry married Rachel Ann Barnes less than two years later. Differing from his father, Henry entered into the trade of a printer to support his growing family. In his chosen occupation, Henry Polkinhorn was extremely successful. After a few years of increasing success in his printing trade, Polkinhorn was able to erect his own building at 634 D Street NW between 6th and 7th streets. As with all printers of the day, Polkinhorn ran a diversified printing company. In each major area of his business, he printed materials connected to the assassination of Abraham Lincoln in 1865. First, he printed newspapers. Not only did he print them for others, he even started a couple on his own like Our Newspaper and the Constitutional Union. Another newspaper he printed was the National Intelligencer. The office of the Intelligencer was right across the street from Henry Polkinhorn’s printing office. This provided steady income for Henry Polkinhorn and convenience for the Intelligencer management. The Intelligencer also relates to the assassination of Lincoln, as it was one of the best newspapers for daily coverage of the trial of the conspirators. Even to this day, issues of the National Intelligencer have been microfilmed by the National Archives and housed with the Lincoln assassination papers due to their relevance and content. Polkinhorn would have even more connection with the Intelligencer after the trial was over. By late 1868, the National Intelligencer was broke. The owners, who had taken it over in 1865, had run it into the ground and owed thousands of dollars to many people. The biggest debt they owed was to Henry Polkinhorn. For his printing of their paper, they owed him over $50,000. Fed up, he finally called to settle his tab. With no money to pay him, the owners transferred the Intelligencer completely over to Polkinhorn. Henry continued to make and print the Intelligencer until he himself was able to sell it off. Shortly thereafter, the Intelligencer merged with the Washington Express and effectively died. While newspapers provided daily work for Henry Polkinhorn, he was also well known for his book printing. He devoted a whole floor in his five story building for Book and Job Printing. Many famous and common citizens went to him to print their books. An online search for “Polkinhorn printer” and alike will yield numerous nineteenth century books that were printed from his D street establishment. On the brink of the Civil War, Polkinhorn printed, in book form, a letter by Joseph Holt explaining the dangers that were to come and his satisfaction that his own home state of Kentucky choose to stay with the Union. Holt would later be named the Judge Advocate General, and chief prosecutor at the trial of the Lincoln conspirators. During the trial, Polkinhorn printed many pamphlets containing the testimony of the trial pertaining to certain individuals like Dr. Mudd and Edman Spangler. Polkinhorn also published Thomas Ewing’s argument against the jurisdiction of the military tribunal that tried the conspirators. He also printed a plethora of other books on wide range of topics. One book that sticks out is a doctor’s thesis about the dangers of cemeteries in populated areas. The doctor blames many of the illnesses and sicknesses of those living in Georgetown on the nearby cemetery “Oak Hill”. He called for the immediate closing of the cemetery and for the removal of the bodies. 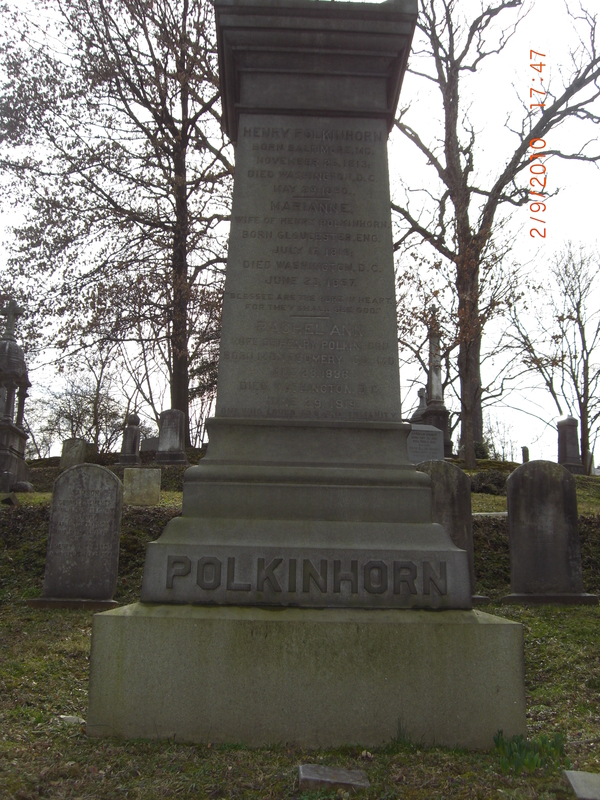 When Henry Polkinhorn died in 1890, he was buried at Oak Hill. While the newspaper and book printing jobs loosely connect him to the assassination of Lincoln, Henry Polkinhorn’s real relationship to the death of our 16th president is based on several individual pieces of paper, 18 inches long. On top of his already multipurpose book and newspaper printing, Polkinhorn also has the honor of printing one of the most sought after relics of Lincoln’s assassination: the playbill from Our American Cousin. A true playbill from Ford’s Theatre on April 14th, 1865. 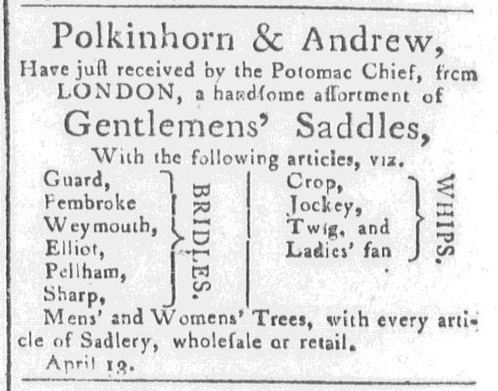 Polkinhorn’s was the “go to” establishment for Ford’s Theatre for their playbills. 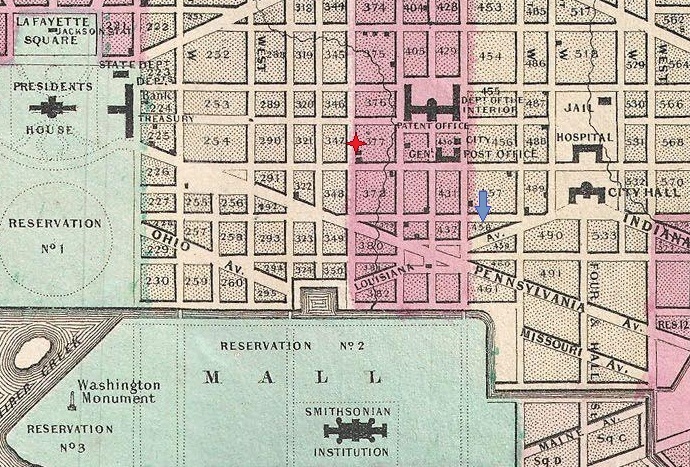 The map that started this post has a red star marking where Ford’s Theatre is. Polkinhorn’s office was less than a half mile away, making him a perfect place for the Ford’s to do their business. In the Harvard Theatre Collection there is a ten by twenty inch bound volume of Ford’s Theatre playbills originally belonging to John B. Wright, stage manager at Ford’s. The volume contains 193 playbills commencing from August of 1864 until the closing of the theatre after the events of April 14th, 1865. A look at this volume shows that “H. Polkinhorn & Son” was the regular printer of the Ford’s Theatre playbills. The “son” in “Polkinhorn & Son” was Henry’s son Samuel Polkinhorn. After Henry retired, Samuel would partner up with his cousin, Richard Oliver Polkinhorn, who worked in the Polkinhorn building and was a talented printer in his own right. “S & R. O. Polkinhorn, Printers” would last about a year before Samuel decided to bow out leaving his cousin as the sole owner of “R. O. Polkinhorn, Printer”. Richard would create “R. O. Polkinhorn & Son” with his son Joseph and the Polkinhorn printing legacy would go on. For a detailed look at the assassination playbills read the follow up post here. What is important to know is that the only legitimate “Our American Cousin” playbills were printed by “H. Polkinhorn & Son”. Any playbills bearing a different printer other than Polkinhorn are reprints or souvenirs. Also, while Polkinhorn did print two different versions of the playbill, neither of them mention anything about President Lincoln. Another printer named Brown would later print his own, slightly similar looking playbills announcing that “this evening the performance will be honored by the attendance of President Lincoln” and many people are fooled today into thinking they are legitimate, when they are not. After retiring from the printing game, Henry Polkinhorn’s success allowed him to purchase a couple buildings and houses that he rented out. In 1881, his own printing building (then being run by his nephew R. O. Polkinhorn) caught fire and the was severely damaged. The entire fifth floor burned down, and was never replaced. The rest of the building was repaired for a cost of around $20,000. Henry Polkinhorn died on May 29th, 1890 at the age of 76. He was interred at Oak Hill cemetery in lot #821. Today, he rests there with his two wives and most of his children. The Polkinhorn building, not far from Ford’s, survived until the late 1980’s when most of the block was torn down for redevelopment. Polkinhorn Building in March of 1987 before being demolished. At the end of it all, Henry Polkinhorn and his family represent the American dream in the best way. His father imigrated from England, found success as a saddler, and saw his own son become one of the most respected printers in Washington, DC. In his long and fruitful career, Henry Polkinhorn made a name for himself and today, at the bottom of one of the most sought after relics of the tragedy at Ford’s Theatre, that name get the final billing. I would like to thank Dale Stinchcomb at the Harvard Theatre Collection for the image of Mr. Polkinhorn, Kia Fennell for her assistance in figuring out his genealogy, and Rich Smyth for the picture of his grave. Very interesting Dave and a nice bit of research. I have a Polkinhorn Ford’s bill from Jan. ’65 and over the years, I’ve only seen 3 on the market. They’re a very rare find. Thanks for this piece! That is a very cool piece to own. Someday I want to visit the Harvard Theatre Collection, to flip through Wright’s collection of Ford’s playbills. They also have this massive collage of individuals relating to the play bordering a Buckingham reprint of the playbill. It was from this collage that I got my picture of Henry Polkinhorn. Interesting, thank you. Also: Henry Polkinhorn was one of the original shareholders in the rebuilt Ford’s Theatre in 1863, along with actress Maggie Mitchell and National Intelligencer editor John F. Coyle. You are right! According to the book Ford’s Theatre and the Lincoln Assassination by Victoria Grieve, Polkinhorn was an investor in Ford’s new theatre after the fire burned down the old tenth street baptist church that he had remodeled into the theatre. With money from Polkinhorn, many other generous individuals, and sympathtic theatre owners (Ford’s rival Grover’s held a benefit to raise money even) he was able to build Ford’s Theatre as it appears today. John Coyle, as you mention, was the Intelligencer editor who ran the newspaper into such debt. His mismanagment of funds and lavish lifestyle is what resulted in Polkinhorn owning the newspaper. Thank you Rich for the grave picture. I’m hoping to do an in depth post about the many differing “Our American Cousin” playbills. The best resource for authenticating playbills is Walter Brenner’s privately printed “Ford’s Theatre Lincoln Assassination Playbills: a Study”. I have a copy of his text and will highlight it here one of these days. You and I both know that the large playbill display at the Ford’s Theatre museum is sadly a Buckingham reprint. The NPS does have a genuine second issue in storage that I saw with your partner in crime. It was part of Oldroyd’s collection and is in rough shape today. Just a piece of trivia, but I told Dave when he first printed the piece on Polkinhorn that there was a doctor with that name in DC who treated my grandmother in the early-1900s. Dave responded that yes, that doctor was this Polkinhorn’s grandson, a well-respected ear, nose, and throat doctor of the day. He also passed on juicy tidbits about Dr. Polkinhorn’s reputation as a husband! Six degrees of separation again when I deal with the assassination story. It’s been a while since I did my work on the Polkinhorns. Most of the genealogical information I have came from a lady by the name of Kia Fennell. If you have an Ancestry.com account I would look her up as she is the one who aided me. I have it in my head that Richard W. was married twice but I’m not sure. Sorry, I couldn’t be of more help. Thanks for all of this wonderful research. My cousin Kate sent me a link to your post. Our grandfather Dr Raphael Sherfy was married to Hannah Mae Polkinhorn who died in childbirth in 1911 after having twins. Dr Sherfy remarried and took Grace Polkinhorn (Hannah’ sister) as his new wife and she raised my father Laurence and Kate’s father Raphael. My father Larry was given Polkinhorn as his middle name and although he didn’t like it, he saddled me with that middle name (that I of course tried to hid from friends all of my years in school). Grace Polkinhorn Sherfy died in around 1983 and my brother Fred found some old Polkinhorn Printers materials while he was cleaning out the house. I have not researched Hannah and Grace’s family, we just knew that somehow she was related to Polkinhorn Printers. I now wonder if Hannah and Grace were two of the 3 daughters William Steinmetz was wondering about in his post. As an aside, I guess you can say that both the Polkinhorns and Sherfys had their brief moment in the sun historically. While Polkinhorn Printers printed play bills for Ford’s theater, including the one you mention, the Sherfy’s moment came when Joseph Sherfy’s home and Peach Orchard became the center of the fight on day two of the battle of Gettysburg. Unlike the Polkinhorn Building, the “Sherfy House” is preserved as part of the national park at Gettysburg and looks much like it did on July 2, 1863. Thanks for commenting, Joseph. It’s nice to see the family name continuing on even as a middle name. I’m glad I could teach you a little about your family’s connection to history and Ford’s Theatre. I am a Great-great-granddaughter of Richard Wallace Polkinhorn. His daughter, Clara Elizabeth Polkinhorn Wylie, was my great-grandmother. Hannah and Grace were NOT her sisters. One of Polkinhorn’s sons (or grandsons) was an ENT doctor for my grandmother in the early-1900s. Now seeing these new posts I spent a little time online it seems that my grandmothers’ Hannah Mae (Sherfy) and Grace Polkinhorn (Sherfy) were grand daughters of Richard O Polkinhorn,….. his son Joseph Henry being their father. So they had a direct tie to the print shop. No wonder my brother found of some printed items when he was cleaning out the house after Grace died. Enjoyed the whole piece – thanks. There is one area that may deserve another look. My research suggests that Marianne Barnes is the daughter of Samuel and Hannah Barnes (all born in England and immigrants to this country). The Henry Polkinhorn Census for 1850 has his wife enumerated as Mary A. (age 30, born in England) & includes 5 of their children — Martha, Hannah, Samuel, Catherine, & Mary A. (both Mary A.’s should be Marianne; & note the grandchildren named for the grandparents Samuel & Hannah). Henry’s wife Marianne died in 1857 – headstone says she was born in Gloucester, England in 1818. I do not find a 2nd marriage date, but the 1860 Census has Henry’s wife as Rachel A. (age 22 born in Maryland) & includes the 5 Henry/Marianne children from the 1850 Census, plus another child born to them, Henry (b. 1852). Also in the household is Henry & Rachel’s daughter, Emma F. (born 1859), Jane Polkinhorn (age 47-probably Henry’s sister or other relative), Edwin Perry (age 17 – Rachel’s brother; he’s in the 1850 Perry household enumeration along with Rachel, her widowed mother, & other Perry children) and three other apparently unrelated persons. Rachel is the daughter of Erasmus and Ruth A. (Williams) Perry. Henry & Rachel’s daughter Emma died in 1862 & it does not appear that Henry & Rachel had any other children. Marianne & Henry also had a daughter named Emma (born 1856 – died 1858). Both Emma’s are listed on the Polkinhorn monument in D.C.’s Oak Hill Cemetery (where Barnes & Polkinhorns are interred). I got to the Polkinhorns because a note on the Find a Grave memorial for Hannah Barnes (died a widow in 1872) says that she died at the home of her son-in-law, Henry Polkinhorn and things seemed to fall into place with only a few fuzzy bits. Fuzzy bits are: (1) No children are listed with a Samuel & ‘Ann’ Barnes on a list of foreign passengers arriving at the Port of Alexandria between 01 April & 31 June 1830. Not positive this is for the relevant Samuel & Hannah Barnes & do not have other information as to how many times they may have traveled or why daughter is not listed in 1830; (2) Marianne’s birth date is not well nailed down. Her age in the 1850 Census suggests her birth in 1820, while the date cited on the headstone is 1818, & a Gloucester, England birth record for a Marianne Barnes cites 1830 – so those have a 12-year window; (3) DAR lineage information, an application for the Sons of the American Revolution, & the District of Columbia’s compiled marriage record for Henry & Marianne all cite Marianne’s maiden name as Brown. Seems possible (even probable that Barnes was misheard or mis-remembered) as Brown and that all these sources stem from the same mistake on the maiden surname for Marianne. To my mind, these less than perfect points take far less weight than the rest of the supporting material. First – my apologies for not waiting a little longer than I did to comment on 10 Jun 2018. Yesterday I found the will of Catherine E. Polkinhorn in which she cites her mother as Maryanne Brown Polkinhorn & her grandfather as Thomas Brown (an English portrait painter – she was bequeathing his miniatures to an heir). So my thought that the Marianne B. was the daughter of Samuel & Hannah Barnes is wrong & to be disregarded. It is accurate that Marianne Brown was Henry Polkinhorn’s 1st wife & Rachel Ann Perry was his 2nd. The Henry Polkinhorn household enumeration for 1860 includes both 2nd wife, Rachel A. (age 22) & her brother, Edwin Perry (enumerated as a 17-year-old apprentice printer). [There are no children in the Barnes’ censuses of 1850, 1860 or 1870.] Nevertheless, there has to be some relationship between the Polkinhorns & Barnes families since Hannah Barnes’ death notice states she died at son-in-law Henry Polkinhorn’s residence, Henry & Marianne named children Hannah & Samuel, & the Barneses & several Polkinhorns are interred in the same lot in Washington, D.C.’s Oak Hill Cemetery. I’ll keep working on this mystery. Again, sorry to have put incorrect information in my 10 Jun 2018 note.